The impact of aerosols on climate can be categorized into direct and indirect effects. The direct effect includes scattering and absorption of radiation due to the presence of e.g. fossil fuel black carbon, while the indirect effect arises from modification of cloud properties such as albedo (reflectivity) induced by salts, inorganic acids and organic compounds that occur in atmosphere. In this project, we seek to narrow the gap between currently available theories and actual observations by carrying out state-of-the-art theoretical simulations of aerosol droplets with designated sizes and compositions. Specifically, target compounds of interest include Na+/Cl−ions, sulphuric acid, pinonic acid, polysaccharides and polycyclic aromatic hydrocarbons, corresponding to both naturally occurring cloud nucleating species and pollutants emitted from human activities. Understanding the role of these compounds in climate changing is of fundamental importance in establishing reliable climate models. 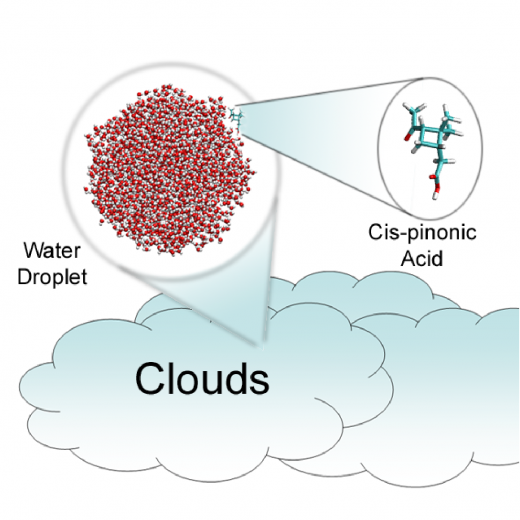 Based on statistical mechanics and molecular dynamics accurate numerical computations simulations can provide microscopic insight into the interaction between target solute molecules and water molecules as well as the impact on physicochemical properties of droplets. Moreover, the combination of quantum mechanics (QM) and molecular mechanics (MM) techniques provides a very effective approach to study the scattering and absorption effects of aerosol droplets. With state-of-the-art simulation methods and powerful supercomputers, we aim to establish unified relationships between target compounds and their impacts on climate.